There is no replacement for a strong academic education – it is undeniably important for a child’s success. That being said, the skills that are not taught routinely in a traditional school setting are now recognized as the most critical in providing a bright future for today’s youth. 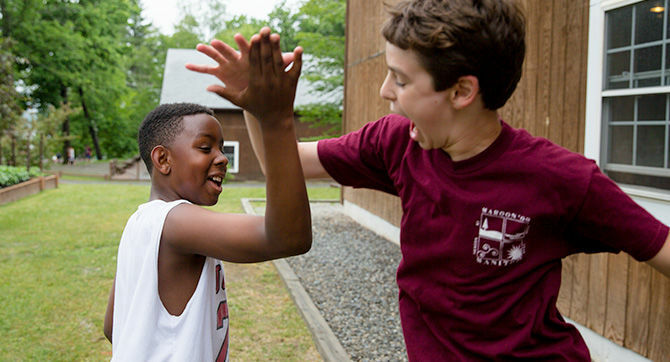 These skills – communication, collaboration, creativity, grit and empathy – are taught, and practiced, for fifteen hours a day, every day, at camp. While campers and counselors may view camp as the most fun and carefree time of their lives, the value of the life skills learned at summer camp can’t be underscored. Camp Manitou prides itself on its ability to cultivate social and character skills such as enthusiasm, creativity, critical thinking, work ethic, communication, cooperation, empathy and acceptance. In many ways, summer camp is a non-stop intensive course in valuable life skills. Living in a cabin with others fosters communication, empathy and collaboration as well as independence and self-reliance. Healthy competition, especially College League and Color War, help develop teamwork, creativity, enthusiasm, perseverance as well as core values such as honor, integrity and respect. Manitou prides itself on hiring and retaining the highest quality staff who effectively model desired behaviors and traits to our campers.